Hello! My name is Kelli and I love stained glass. The love affair started years ago. I have always been a fan of artsy/crafty stuff, handmade for the most part. I love art and wine fairs, craft fairs, all that stuff. Glass and pottery have always been special favorites. Several years ago, when I was finally in a position financially, to be able to take a pottery class, I did, and loved it. Unfortunately, a shoulder injury ended that. Hard to pull something up on the potters wheel when your shoulder is jacked up. In 2001 I was fortunate enough to go to Paris. Paris was a delight, all the architecture and stonework, the statues and monuments, the art and of course, the cathedrals. One in particular took my breath away; Sainte-Chapelle. Built in 1248, it took only two years to be built (an astonishingly short span of time. Notre Dame took 180 years to complete). Initially built to house the Crown of Thorns and a fragment of the True Cross, the structure is small, compared to Notre Dame. I didn’t make it into Notre Dame (the lines were hellish long and it was pouring rain) so I cannot compare the two cathedral’s glass, but the Sainte-Chapelle’s glass is mind blowing. The upper part of the cathedral was reserved for the king, Louis IX, so is resplendent with the finest craftmanship available at the time. The entire upper portion is walled in stained glass, depicting scenes from the bible. Back in those days, almost everyone was illiterate, so pictures were the only way to go. There are 6456 square feet of stained glass in those windows. They were removed before WWII, in anticipation of Hitler’s invasion, as where most of the works of art from the Louvre. They were lovingly restored in the 19th century, but pollution is taking a toll on the glass, eating away at the lead and painting. If you ever visit Paris, go to Sainte-Chapelle, it is gorgeous. After this trip, I was very smitten with the art, and determined to learn it. 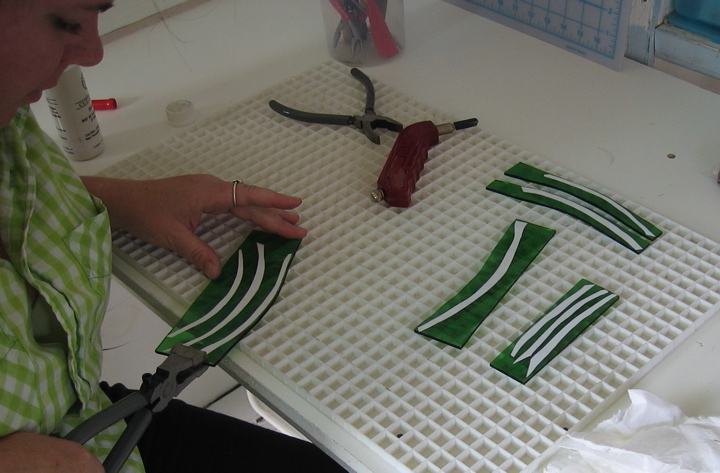 In 2005, a local Adult Education Class offered a beginner’s stained glass class, and I signed up. Instantly hooked, like a trout on the line. I have take a couple additional classes since then, and frequently ask questions at the local glass shop, but for the most part, what I have learned is from books, experimentation, and talking to other glass artists. It is immensely rewarding to take a design from conception to hanging in the window. To be a part of the birth of beauty. I love working with it, and I hope you enjoy my pictures and notes on each piece. Are you still selling your work? I adore your Buddha and lotus pieces. As well as the Ganesha. Please let me know if there are any available for purchase. What a generous thing to say! Thank you! I definitely sell my work.The Buddha and Lotus is sold, but it is my own pattern, and I can easily remake it. Ganesha is my personal piece, not sure I want to sell him… working on him was a refuge for me during a difficult time. But again, its my pattern and I can do another one. I am in fact doing a second ganesha piece for a friend, so I have two versions, the dancing ganesha version with the outdoor background, and a more traditional pose, with him sitting on his lotus throne. I think I have a pic of that second version on the site. anyway, let me know if you want something, and we’ll talk prices and colors. the smaller buddha piece was $65 I believe, so something like that, unless you go larger. thanks you much for the interest. absolutely am selling it. at this time, i do not have anything ready to ship. working on christmas commissions, lol. I am happy to take an order though. i have time for one more piece by christmas, if you are interested. Hi I love your work and was wonder with the lotus is it copper foil on top of a solid piece of glass or are all the pieces cut? if that makes sense? the reason I ask is how did you manage to get such sharp points on the blue background?? as I am cutting something with points like that and they keep breaking?? thank you for the compliments. each piece is cut out. I have a taurus ring saw for that stuff. sometimes it feels like cheating, lol, but i love my saw. the only other way you can do those sharp angles, and they don’t turn out sharp but it does work, is to grind it down. you have to switch your bits out smaller and smaller, until you are using the thinnest bit, but it does work. depends on your patience level. good luck! send me some photos, would love to see your work. lady helen, thank you for the kind words. the pattern is a bastardization of a stained glass news pattern and my own modification. they published it, so I assume it is usable. i made some mods to the petals along the bottom, because I didn’t like their shape. i have no issues wit your using it. i have a cleaned up black and white pdf at home. i’ll send when i get home, or sometime over the weekend. sorry, things arevery busy right now and I seem to have misplaced half my brain, lol. is is the ganesh available?i would love to have it for my collection.thanks. Both piece on here are spoken for, but you can commission one of your very own =) If you are honestly interested, i will give you a number to call, or an email to provide a number for me to call, to discuss. thanks for looking. I live In NSW Australia, and came across your page when looking for inspiration for a pattern for bedside lamps. When I saw the waves on the LHS of your Hawaiian Fling, I found some inspiration. Thank you! When I read your comments in ‘About Glasswench’, they really resonated with me. I went to Europe in 1976 and saw Saint-Chapelle and thought it was absolutely stunning. The rose window has been my benchmark for beautiful stained glass ever since, and remains a treasured memory. From about age 18 I wanted to learn to do leadlighting. However when I started work, I moved to a country town and there was no opportunity, so I did lots of other crafty things – macramé (hey, it was the 70’s! ), weaving, applique, fabric painting, making children’s clothes, smocking etc. Then about 15 years ago I saw a Community Education class in leadlighting, and it has been my hobby and passion ever since. I think it’s wonderful that a mutual interest in art and craft can connect people from all over the world. Came across your site while searching for answers to questions (and patterns, of course). Today I’m sitting at my work bench with the fan blowing almost cool air across my back… it’s hot! Of course you gotta understand, I live in Queensland, AU and it’s summer. Temps in the mid-30s. Haven’t live in such heat since the years in Redding, CA, so many years ago. Okay, my quest is for an explanation on how to add the little curves lines of solder (I think) extending beyond a vine for example and out into the background piece. I do hope that makes sense. I attempted to use a small strip of lead came… didn’t look good. So how is it done? I saw what I mean on a couple of your works, dated Jan. 20, 2013 on your site. I have to admit to really liking your Buddha piece. I’m new at this craft but am working on getting better… something like Buddha or the guitar front is my goal. Enough blatther…. I’ll mark the ‘follow’ tab and watch and learn. good morning bill, thanks for the interest in my blog. It sounds like you are doing lead came. i am not sure how to do what you want, the added detail, with came. In copper foil, either foil tape or foil sheeting is used to create an extension of a line.It is called an overlay. you can probably find a demonstration on youtube if you search for foil overlay. if you have no luck, get back to me, and I’ll see if I can walk you thru it. Thank you… I’m using foil, just didn’t know the right question to ask. Now I do. Learn something new every day/project with this… great fun! Hi, my name is Lynda and I love your work! A friend has been going through a very rough time and she loves dragonflies. She saw your piece Dragonflies in grass someplace, I am not sure where.. I would love to make it for her as a surprise to brighten her day. Would you be willing to sell the pattern or let me try and make one from the image? WOuld just be for her, not for sale or anything. Thank you so much, am looking forward to hearing from you. Do you have any more of your northern lights pieces? Or, would you be willing to use the same design but make a smaller version? Hi m name is Sharon and I love your work. I am interested in making the dragonfly in the long grass for my girlfriend. Am I able to buy this pattern from you? yes. email me at glasswenchstudio@gmail.com and I’ll send you the details.